A perfect choice to read for Earth Day on April 22, but lovely to keep on hand for reading any time to foster an appreciation of our planet. I love the stunning photos in this book! Touching on subjects from life cycles to weather, colors, shapes, and patterns, this is an ideal resource for science and language art curriculums and a terrific book for bedtime sharing. 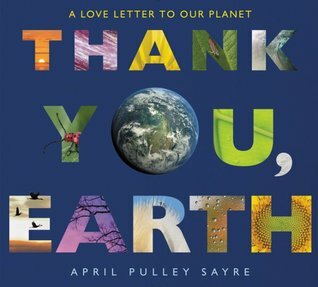 Thank You, Earth is a great choice for Earth Day celebrations, as well as family and group read-alouds. Includes backmatter with kid-friendly ideas for conservation projects information about the photographs, and additional resources. Thank You, Earth was created by April Pulley Sayre and published by Greenwillow Books, an imprint of HarperCollins Publishers in 2018. At first, I wasn’t sure what to expect, but I enjoyed the flow of the language in this story. I appreciated the pauses and variations in the phrasing, so that, even though this was a rhyming text, it had a poetic and thoughtful feel. It’s interesting how the author managed to put together so many diverse aspects of the planet in one book. This book offers lots of ways to connect to learning – math concepts such as patterns or rays and many science and environmental concepts such as seasons, weather, and living things. With stunning close ups of insects and plants, it’s a wonderful book to explore. Perfect for a kindergarten classroom! Explore: Go outside and a take a picture of something you find in your local environment. Add a “thank you” caption to your photo. Student photos could be compiled in a class book. Write: What would you want to tell Planet Earth? Write your own letter to the planet! List: Look closely at the page “Thank you for tiny and towering.” What other tiny things could we find on our planet? What towers over our heads? Make a list. How great is it that Susanna's list starts and ends with this wonderful book? You and Joanna couldn't have planned this better! I almost bought this book, but will for sure now. I love to see stunning photographs in books for kids. This is a winner!